If you want to stay alive to the world, it’s important to avoid becoming segregated from the needs around you. Wholeheartedly embracing a life of change means opening your eyes to the pain of the world and letting it shape you. That’s one of the reasons travelling can be so good. It helps us to break out of our normal habits of who we usually talk to and where we usually go. Surrounded by a world we don’t recognise, we do things that are outside of our ‘comfort zones’ and we feel great because of it. A recent study showed that the 20% most wealthy Americans give away an average of 1.3% of their income, while the poorest 20% give away 3.2%. What is it that makes the wealthy so stingy? This is an important lesson for us wannabe Change Makers. If we want to be the kind of people who cause change, we must expose ourselves to need and pain. Once we know people who are suffering, we’re more inclined to identify their needs, and to make decisions about what we should do about them. Although this segregation is no longer vested in the law, the infrastructures remain the same. 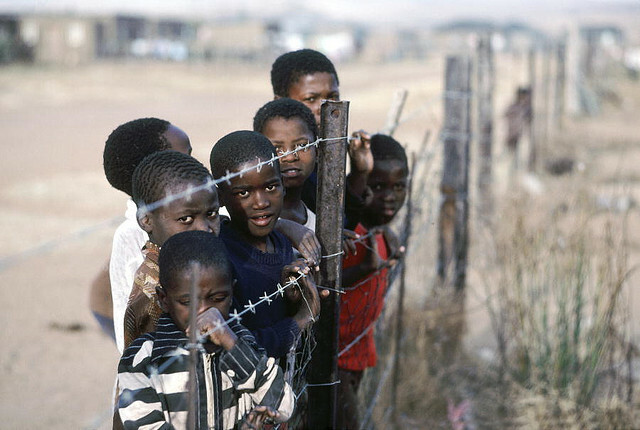 Black people live in black settlements, mixed race people in mixed race settlements, and white people in areas of prime real estate inhabited mainly by whites. It’s rare for white people to have relationships of equality (real friendships) with people of other races. The black people they encounter are gardeners or domestic workers, cashiers or waste collectors. They are relationships with an unequal balance of power, in which the black person is subservient to the white person. This setup fosters insulation, and works against the progress of change. The design of the city encourages and enables the rich to turn a blind eye to the day-to-day realities of the poor. They don’t see their pain, and therefore don’t feel motivated to do anything about it. Of course South Africa is just an extreme example of a natural habit of the human condition. We push those on the margin out of sight, and those with power and riches to centre stage. We naturally choose the path of least resistance, where we won’t be inconvenienced by someone asking us for change, or expressing their pain. We close our eyes and hope that someone ‘higher up’ will do something about it, forgetting that those ‘higher up’ are elected as our representatives and will only focus on things they believe matter to us. Do you find yourself insulated from the needs around you? Is there a small step you could take to connect more with the world’s pain?